Step in style with the Disney Baby Minnie Mouse Bows and Butterflies Baby Walker! 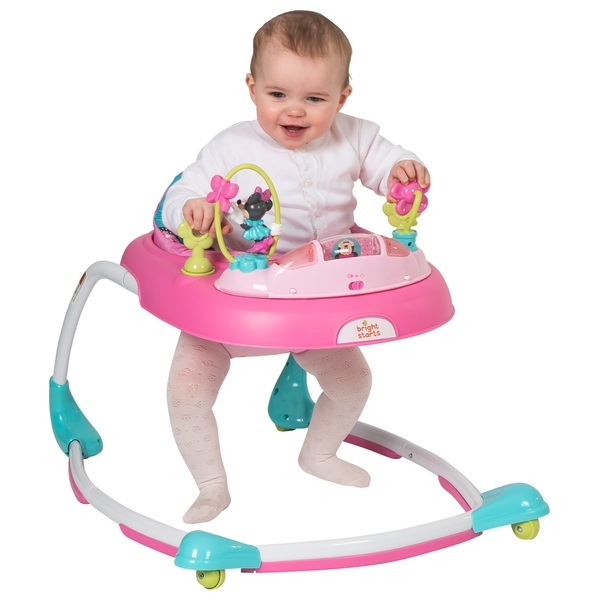 This beautiful walker is sure to make playtime magical for little Minnie Mouse fans. This Minnie-themed walker is fabulous fun! The electronic toy station packs in tons of play, and can easily be removed from the walker frame for floor play. The Disney Baby Minnie Mouse Bows and Butterflies Baby Walker features enchanting lights, fun sounds, piano keys, a flower with beads and an adorable Minnie bead chaser to encourage playtime with Minnie Mouse. With a high back to support baby and 3 different height positions to provide growing room, the seat of the Disney Baby Minnie Mouse Bows and Butterflies Baby Walker is just right. The built-in toy tray gives your child plenty of room to play and is super easy to clean. The walker even has 2 toy loops so you can attach baby’s favourite toys, giving your little one even more ways to play as they learn to walk. The Disney Baby Minnie Mouse Bows and ButterfliesBaby Walker is designed with a unique elliptical frame that provides a sturdy platform that wheels along with little ones as they learn to walk.